I'm not sure whether to thank Michael or not for coming across this. Why are magpies so often hated? Magpies do not steal trinkets and are positively scared of shiny objects, according to new research. The study appears to redeem the myth of the “thieving magpie”, which pervades European folklore. It is widely believed that magpies have a compulsive urge to steal sparkly things for their nests. But Exeter University scientists show that the birds are actually nervous of such objects, presumably because they are novel and may prove dangerous. The study involved a pile of shiny items (metal screws, small foil rings, and a small rectangular piece of aluminium foil), and a pile of the same objects covered with matt blue paint. Lead author Dr Toni Shephard said: “We did not find evidence of an unconditional attraction to shiny objects in magpies. Instead, all objects prompted responses indicating neophobia – fear of new things. 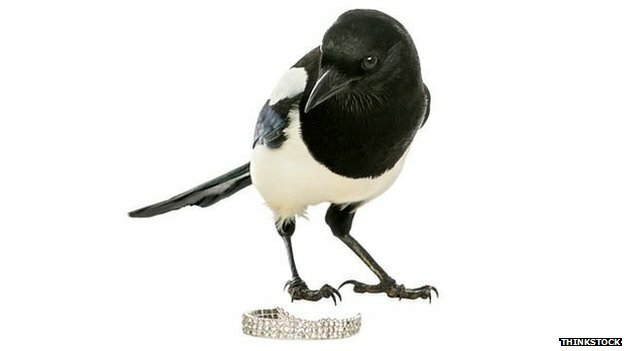 The scientists – psychologists from the Centre for Research in Animal Behaviour (CRAB) - undertook the study after an internet search uncovered just two published accounts of magpies actually stealing shiny things: a missing engagement ring found in a nest in 2008, and a magpie in Rochdale stealing keys, coins, and a spanner from an automotive garage a year earlier. Dr Shephard told BBC News: "Some birds do use eye-catching objects in the nest after mating occurs, like black kites, to warn off potential predators. But we had already looked inside a dozen magpie nests and not seen any shiny objects. So, I was not expecting magpies to use objects for this purpose." The test may challenge the Collins English Dictionary definition of the magpie as "a person who hoards small objects". It may prompt calls for a belated revision of the libretto of Rossini's opera La Gazza Ladra (The thieving magpie), which features a servant girl sentenced to death for a series of silver thefts actually committed by a magpie. It may upset, too, the publishers of The Tintin comic The Castafiore Emerald, in which a prized gem is stolen by a magpie. But the research is not conclusive – yet. Due to the nature of the test with fixed feeding stations, the scientists could only assess "married" magpies that inhabit a set territory. Single magpies without a steady partner are less predictable in their feeding habits. So maybe, just maybe, it is bachelor birds wanting to woo potential mates with silver rings that have sullied the birds’ name.